BASEL, 7 MARCH 2012 – American timepiece manufacturer DEVON has earned a reputation for turning out dazzling designs that challenge industry conventions and create buzz all around the world. Their debut watch, the Tread 1 recently made its way to the finals of the highly respected GRAND PRIX D’HORLOGERIE DE GENEƱVE in the category of Best Design and Concept Watch – a feat never before achieved by an American watch brand. Since then people the world over have been wondering what might be coming next from this independent and bold newcomer, and now heir wait is over. Today at the Baselworld Exposition, the world’s largest watch nd jewelry show, DEVON has unveiled its follow‐up timepiece, the Tread 2. “Our products are designed, developed, engineered and manufactured in Southern California with American aerospace engineers and suppliers who are not constrained by tradition or status‐quo but are accustomed to pushing the boundaries of what’s been done before,” said Scott Devon, the company’s founder. Tread 2 continues the use of the Tread 1’s patented movement technology employing an innovative system of fiberglass‐reinforced nylon Time Belts. The belts are only 2/1000th’s of an inch thick and are a technology appropriated directly out of the cockpits of airliners like the Boeing 747 where they indicated vital measurements such as air speed and fluid levels. The belts are mounted on a central chassis and driven by two extremely compact microstep motors. These motors and all other watch functions are controlled by a microcontroller, essentially an extremely compact computer inside the heart of the watch. Loaded with DEVON’s proprietary software, this computer manages all of the timepiece’s functions and ensure precision time‐keeping, the preliminary testing of which indicates an unusually accurate tolerance of only one half‐second per day. 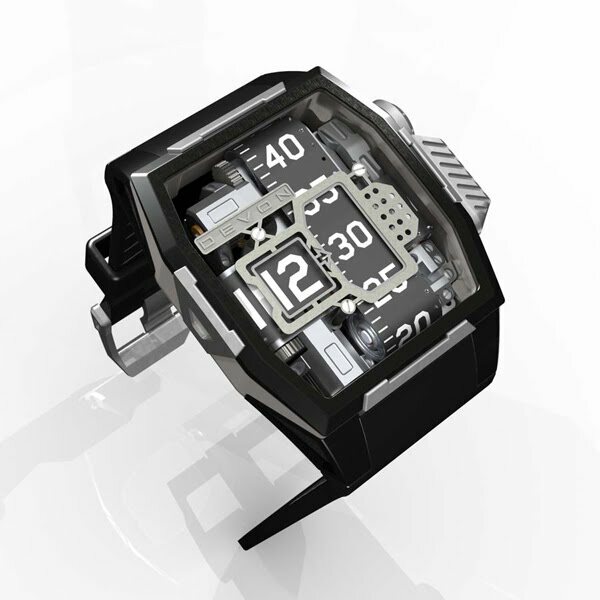 To make the watch practical DEVON has designed the movement to be what it calls a “hybrid” – combining a highly mechanical masterpiece of moving parts with a system that stores extra energy in a lithium‐polymer battery pack rather than a mainspring. This innovation allow the Tread 2 to be offered at a relatively affordable starting price of around $10,000 while also offering a very generous power reserve estimated at up to fourteen days on a single charge. As with the Tread 1, when a recharge is necessary, simply placing the watch onto its charging cradle will wirelessly charge the battery through the use of electromagnetic induction in only a few hours. Other innovations seen on the Tread 2 include a one‐of‐a‐kind clamp system used to secure the bezel to the case, the crown’s unmistakably unique articulating arm and jeweled bearings in the movement’s pulley system that ensure free and easy movement with no lubrication necessary. Production will begin in the second quarter of this year with deliveries scheduled to commence around July, 2012. DEVON has thus far sold over 400 Tread 1 timepieces through an ever‐increasing network of over 60 retailers in countries all over the world.